1. Safety! It isn't only about being comfortable, it's about being safe. 2. The dive operator requires it. Better to do it before you go and not waste vacation time. 3. Fun! It is more enjoyable when you know what you are doing. Do I have enough weight? Am I going up too fast? How do I attach my regulator to my BCD? Get back in the pool with a PADI instructor and practice your skills and check your buoyancy so you don't feel like a duck out of water! 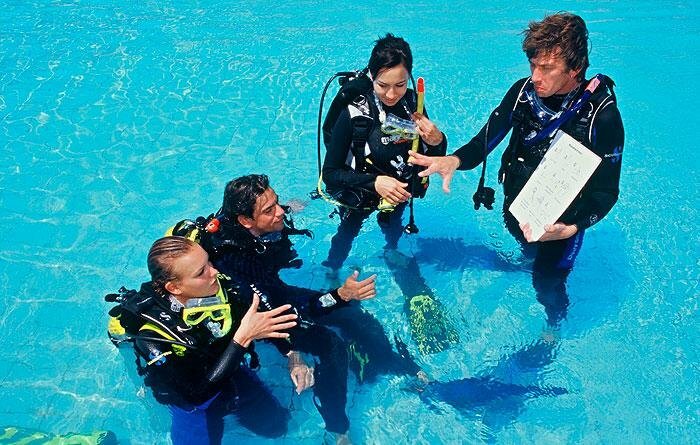 The Scuba Refresher includes some class time to review your dive planner knowledge and discuss the finer points of important diving rules. Then it’s off to the pool for some fun underwater! This class intended for divers who have been diving within the last 8 years. If it has been longer than 8 years since your last dive, or if you prefer a more flexible schedule, please contact us regarding private Scuba Refresher sections. Requirements: Please bring a bathing suit, towel, and scuba/snorkeling equipment you own and all required paperwork.